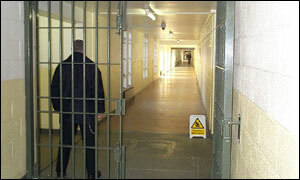 A prison in Leicestershire has been held up as an example for other jails to follow. The praise for Stocken Prison, in Rutland, follows a surprise visit by the Chief Inspector of Prisons in October. Chief inspector Anne Owers said: "We found that the mutually respectful relationships between staff and prisoners at Stocken created a decent, safe and ordered environment." However concerns were raised about the public use of drugs dogs to vet prison visitors. It has been recommended the jail introduce a system for the dog searches to be performed with greater respect for visitors' privacy. An area singled out for praise was the prison's pre-release programme, which included housing advice and personal appointments for inmates. Ms Owers said: "Although we do make some recommendations for development and change... (the prison's) work is to be commended, and should be followed by other similar prisons." Meanwhile, a report into Glen Parva Young Offenders Institute, also in Leicestershire, reveals two serious cases of unrest last year. In its annual report, the Board of Visitors says the incidents were caused by an unprecedented rise in the number of inmates. At times, 50 young men were transferred to Glen Parva each week. The report says some became bored and unsettled, finding themselves hundreds of miles from home. On one occasion, 16 inmates barricaded themselves inside a building.